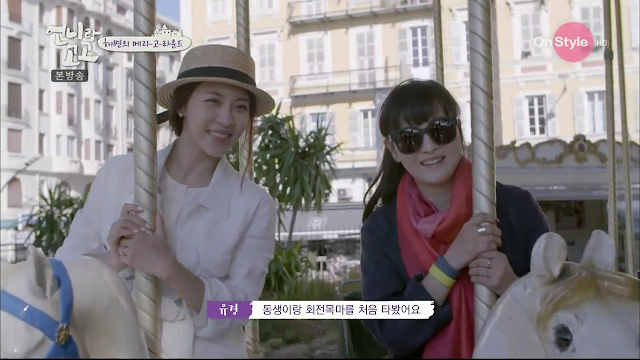 They're headed to Nice this ep! In an interview, Jiwon says "To be honest, it's not like every moment is good. There are hard times and frustrating times and times when I want to cry but....it feels like I'm on a roller coaster." Hahaha it was super hot in the car so Jiwon was trying all sorts of ways to use her hat to shield the sun but it wasn't working. Upon reaching Nice, they start squealing over how gorgeous the place is. "Look at the colour (of the sea)!" Then she starts talking a whole bunch of nonsense about how they're from this neighbourhood and how the people from the other neighbourhood (just random passersby) are chic. 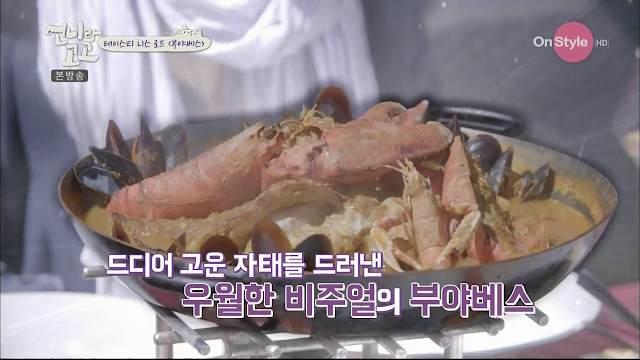 Jiwon did a lot of research so they go to the place she found which serves bouillabaisse. Omo she says she only eats 1.5 meals in Korea, but here she's really hungry and eats all 3 meals. No wonder she can stay so slim! "I think Grasse and South France's soul and energy matches me. When we were going out this morning, the donkey even shouted loudly. It's so cute." Next on their checklist is a shop selling French candy. On the way to Nice Jiwon said that she wanted something sweet and was even researching about it on the plane. As usual, Jiwon's reactions to these stuff are lol-worthy. And because she's so likable, she gets free stuff again!! 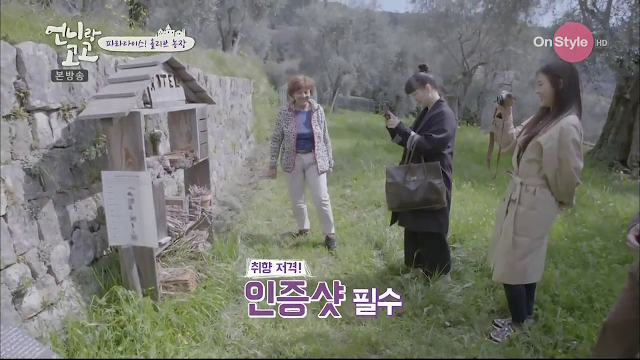 Jiwon wants to buy a gift for her sister in return for the Pinocchio puppet she bought so they enter a shop where there are handmade skirts and figurines and stuff. Yookyung: Hey there's Zoe here! Jiwon: Really? But it is not as cute as our Zoe. In an interview later, Yookyung says that honestly the skirt wasn't really her style haha. 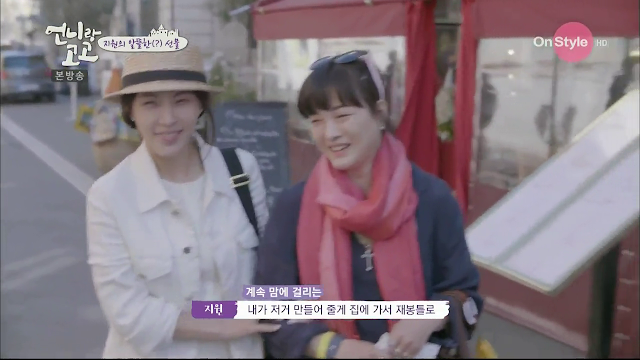 Jiwon ends up buying a scarf for her unnie. 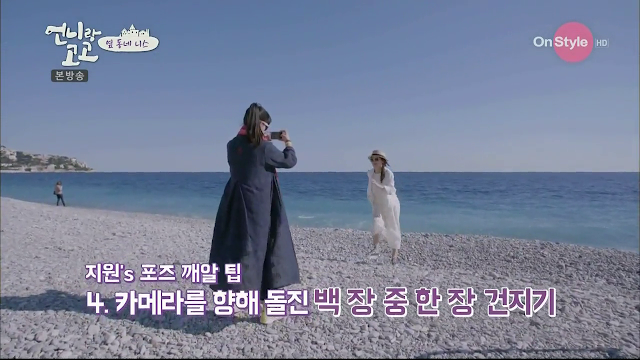 They go the beach for a stroll and to take pictures. Yookyung managed to take a series of pretty shots while Jiwon was running to her. So they tried to recreate it but Yookyung wasn't happy with the result LOL. And then suddenly, Jiwon hears someone calling 'Ha Jiwon!' A bunch of French fans spotted her and she's super happy haha. She spots a merry go round ahead and starts skipping towards it. 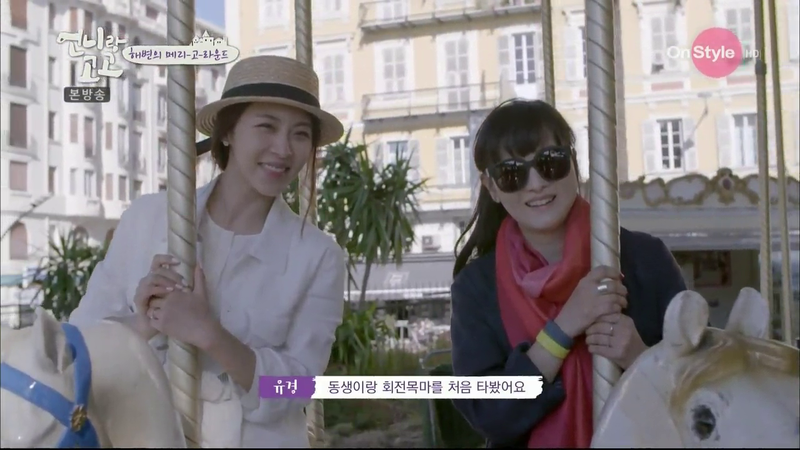 And they decide to ride on white horses cos Jiwon likes horses. 'Usually the parents will wait and then you have to wave to them when you pass by.' so they do that to random people and look a bit crazy. At night, they suddenly start drawing the places they've visited and the house. 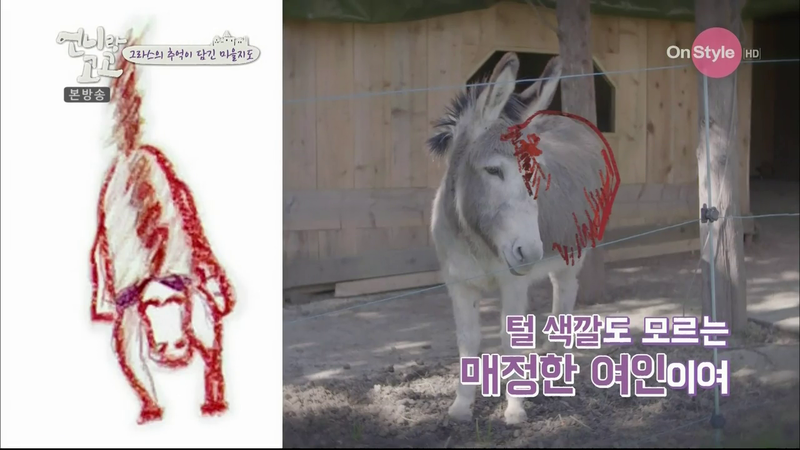 Jiwon: "We must draw the donkey! It. is! very! important!" 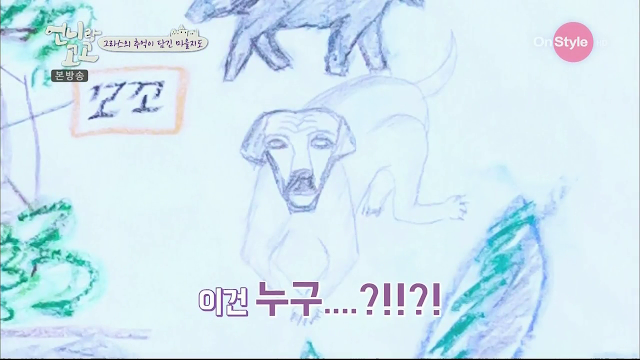 So Yookyung drew it, and it looks a bit strange. And worse, Jiwon colours him the wrong colour!! He's grey not brown! And then they realise there's no road. Jiwon wants to discard the thing and redo it but Yookyung is like no!! When they finally finish, they talk to the camera and ask for it to be turned off since they're done and want to sleep. 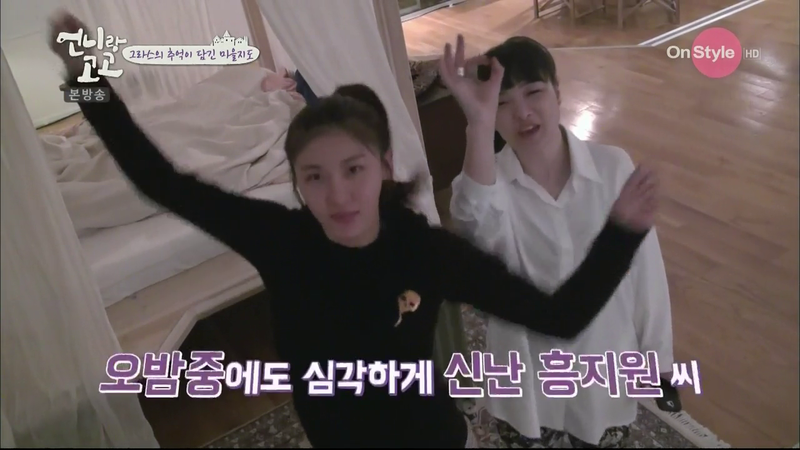 Jiwon is so happy she starts dancing hehe. Then we skip to another day where they're headed to a couple's house for a lunch made of olive stuffs. In the interview, Yookyung says that Jiwon and her have many differences (eg their reactions to stuff - Jiwon will squeal while Yookyung will just say wow quietly) due to their age gap, they have many similarities too like being sensitive to scents and liking olive trees. After the greetings and admiring the view, they visit the compound. Omg so cute there's a hotel for fleas!! Jiwon is very fascinated by this plant with heart shaped leaves. Next is the lunch. Wowwww the food looks amazing. When the hosts were about to remove one of the dishes that she hadn't finished but put aside, she hurriedly took it back and was like 'I'm going to eat that!' So cute haha. Jiwon: "Can I faint for a while?" because the food was so amazing. Jiwon's english has improved so much. So proud of her ^^ She started telling the man about how Yookyung made a massage for her using olive oil and concluded "We love olive oil." hehe. That's it for this ep!